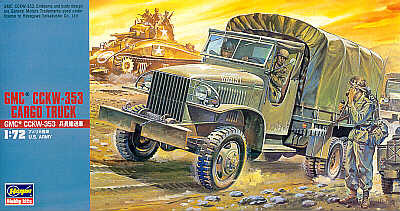 So often overlooked in military history, logistics was a major contributor to the Allied victory in WWII, whether it was Montgomery’s huge build-up of materiel prior to El Alamein, the ‘Red Ball Express’ that supported the push out of Normandy, or the mechanisation of Soviet troops that allowed them to exploit the advances made by their armoured brigades. A key player in all of these campaigns was the humble truck, especially the hundreds of thousands that poured out of American factories throughout the war. 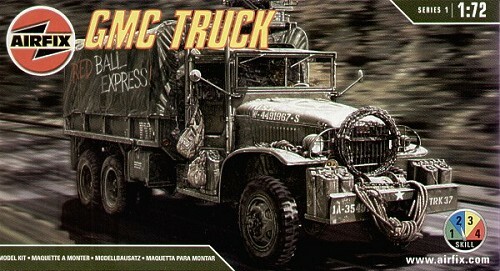 There is now a plethora of 1:72 US trucks on the market, especially the GMC CCKW for which no fewer than four brands are available. But which one is the best? While not a vehicle expert, I thought a comparative inbox review of all four might help other modellers choose between the options. Please note that some of the photos show sprues of slightly different versions from the boxtops (e.g. I have the fire engine version of the PST kit), but the basic comments on accuracy and buildability should nevertheless apply. The Hasegawa kit is now quite long in the tooth and rather crude in places – especially the chassis and suspension – or just plain wrong, such as the wheel hubs. There are at least three options in the range, all soft-top varieties: a dump truck, a fuel tanker and an open-back version with a canvas cover. These kits might be OK for wargaming, given their simplicity and sturdiness, but have been bypassed for detail and quality by the newer offerings. 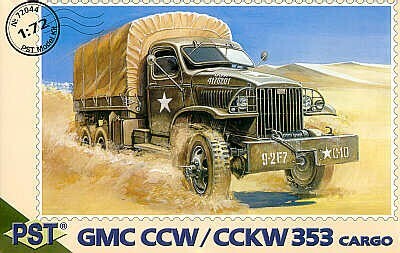 PST took an interesting approach and kitted both the Studebaker US 6 and the GMC CCKW all from the same basic set of sprues. 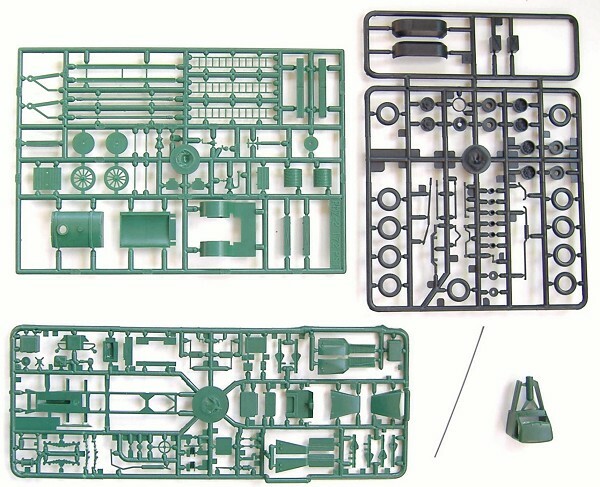 While all represent the hard-top cab, this approach means that each kit leaves the modeller with some excess parts, plus specific sprues for the variant being modelled (including open-back truck with canvas hood, fire engine, tanker and small arms repair shop variants). The mouldings do a reasonable job of capturing the vehicle’s shape and are well thought out – for instance, the tyres are all moulded separate from the wheels, assisting with painting. A rudimentary engine is provided but the cab doors are moulded shut, making interior detailing difficult. 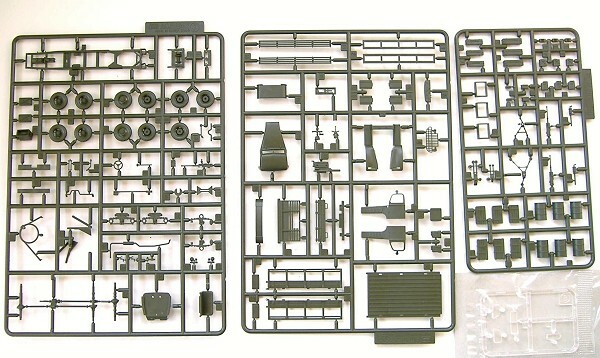 The use of low-pressure injection moulding also means that there is some loss of quality on the finer details such as tread patterns on the running boards or the bars of the radiator grille and headlight guards, leaving the modeller to buy aftermarket upgrade sets or scratchbuild such details. Airfix/Heller brought out a nice kit of the CCKW in 2004. This gives the modeller several options within the one kit, including a choice of a soft tilt or machine-gun mount (which is very nicely done), plus a canvas cover or open back. The driver figure is poor and can be thrown away, but the overall level of moulding is nice and the detail on pieces such as the wheels, machine gun and suspension are good. However, I believe that the front wheels are wrong – they should have six rather than five slots. This is going to be almost impossible to correct without resorting to an aftermarket replacement or raiding another kit (not the Hasegawa one – that also has five slots!). It is clear some thought has been put into ejector pin placement to minimise filling and filing problems, and the doors and windscreen plus surround are moulded as single pieces in clear plastic to minimise the likelihood of problems while gluing. The small decal sheet is good and overall this seems a very buildable little kit. Have I saved the best till last? Well, yes and no. 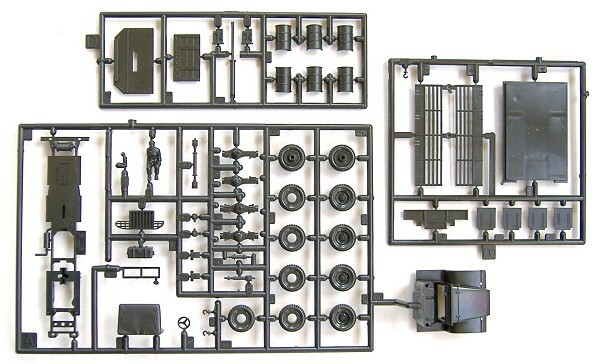 The Academy kit was released in 2005 and offers even better detailing than the Airfix offering, both in terms of the number of parts and the fineness of the mouldings. The tread patterns on the running boards are beautifully done, as are the grab rails, side boards and engine grille. This is a hard-top vehicle, but the modeller can open a circular hole in the roof and install a machine-gun mount if desired. However, no canvas hood is supplied for the tray. Of all four kits, this is the only one to actually have open slots on all of the wheels (the others have at least some that are solid), and while the doors are attached to the cab sides, it will be much easier to cut them open than on the PST kit. 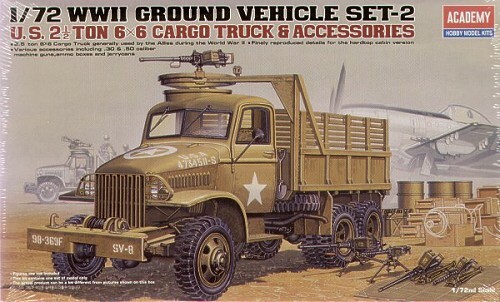 It also comes with a handy set of loads/diorama accessories, including jerrycans, 44-gallon drums, ammo boxes and two each of .50 and .30 calibre machine-guns, with both folded and deployed tripods – all very useful for just about any US vehicle, soft-skin or otherwise. The decal sheet looks good and allows for two options. On the downside, ejector pin marks abound, and while some are hidden away or on inner surfaces, their presence on places like the cab floor, tyres and machine-gun mount – to name a few – means the modeller will have to pay close attention during assembly to work out which need filing (and many will). So which kit gets the thumbs up? 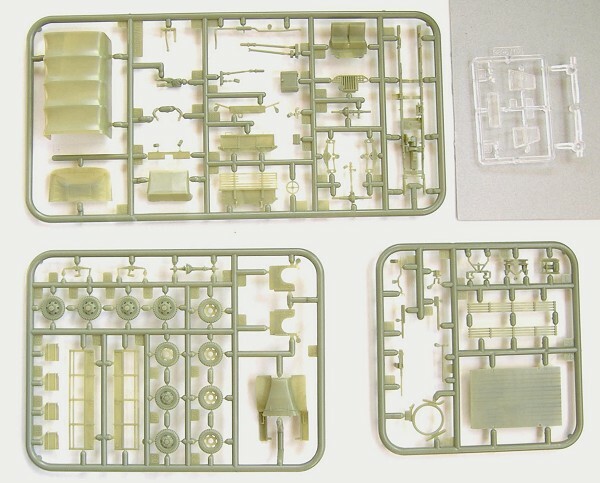 I think the Hasegawa offerings are now superseded, although still quite suitable for younger modellers. The PST kits are OK but will require more work than the mainstream releases, unless you want a specific variant like the fire engine. Between the Airfix and Academy kits it’s a bit of a draw, and may end up depending on whether you want a hard- or soft-top cab. The Academy is the best-moulded of all four and comes with some great extras, but will be fiddly to assemble, especially the ejector pin marks. The Airfix kit probably offers more options within the one box, and (at least in Australia) it’s about a third of the price of the Academy, although the detail is not quite as sharp. For my purposes as an unsophisticated vehicle modeller, my money falls just on the side of the Airfix kit – not in the least because I really want to encourage Airfix to keep coming out with new releases. Given that there are now four different kits of this popular American truck, how about a mainstream kit of that ubiquitous and pugnacious British lorry, the Canadian Pattern Chev ‘Blitz’?